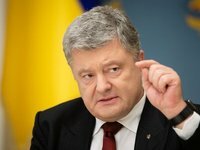 Ukrainian President Petro Poroshenko said that he wants to dismiss Serhiy Semochko as first deputy head of the Ukrainian Foreign Intelligence Service on Friday, April 19. "First deputy head of the Foreign Intelligence Service Gen. Semochko will be dismissed on Friday," Poroshenko told reporters at central Kyiv's Olympiyskiy Stadium on Sunday, where he arrived with hopes to have a debate with presidential candidate Volodymyr Zelensky. The Nashi Hroshi with Denys Bihus anti-corruption investigation show has earlier aired a TV report, which said that the family of the first deputy head of the Foreign Intelligence Service and the former economic counterintelligence chief of the Ukrainian Security Service (SBU), Semochko, has mansions worth millions of dollars outside Kyiv, and his relatives have Russian citizenship, along with the Ukrainian one. The Ukrainian National Anti-Corruption Bureau (NABU) has launched a criminal inquiry into illegal enrichment, in which Semochko is a defendant. The SBU said that as part of the criminal case opened on the basis of journalist Bihus' lawsuit on the charge of high treason described in Part 1 Article 111 of the Ukrainian Criminal Code it is investigating a number of media reports with respect to Semochko. On October 17, Foreign Intelligence Service chief Yehor Bozhok said that there are no legal grounds for dismissing his first deputy Semochko. Kyiv's Shevchenkivsky District Court later said in its ruling that the SBU counterintelligence had confirmed that Semochko's wife and daughter have Russian citizenship. Investigators sought the court to provide access to the phone conversations of Semochko and his family over about five years. The court granted the investigator's motion.